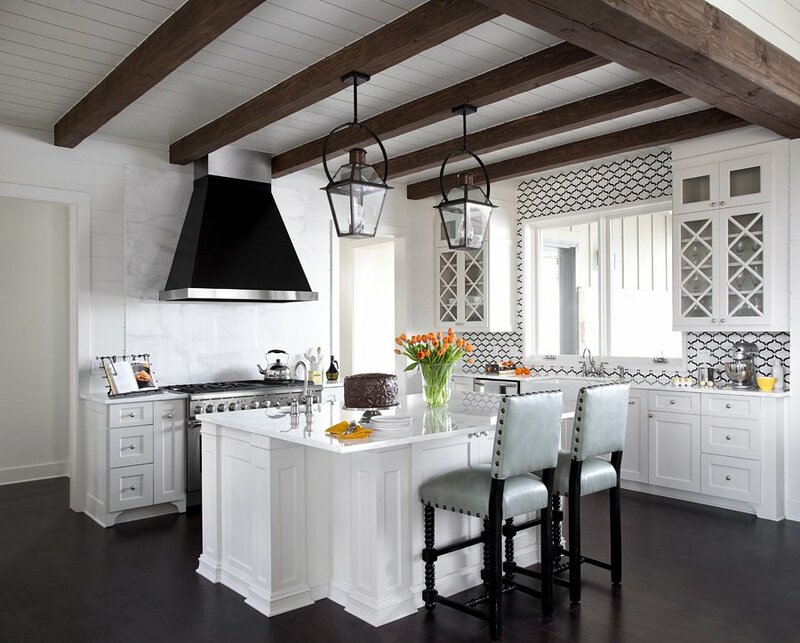 There are so many choices today when it comes to kitchen design. It can certainly be overwhelming to sift through all the noise, especially when we have access to so much information. One of the most popular questions our clients, customers, and avid social media followers ask us is ‘how do you mix metals, especially in a kitchen.’ You don’t want to make the wrong choice, but you want your home to have that personal, collected feel. In today’s blog we hope to make the process feel just a little bit easier and a lot less stressful. 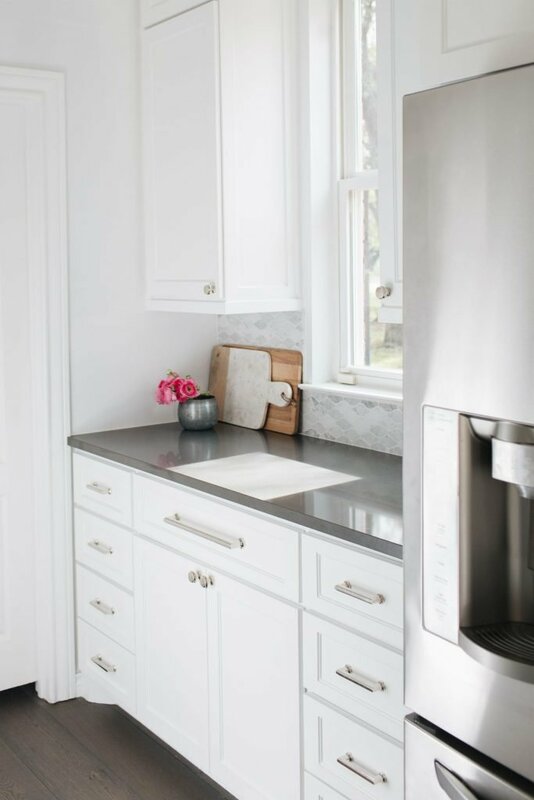 But before we share our easy reference guide on mixing metals, we have a couple of points for you to keep in mind when it comes to your kitchen. 1. Consider your home and design preferences. 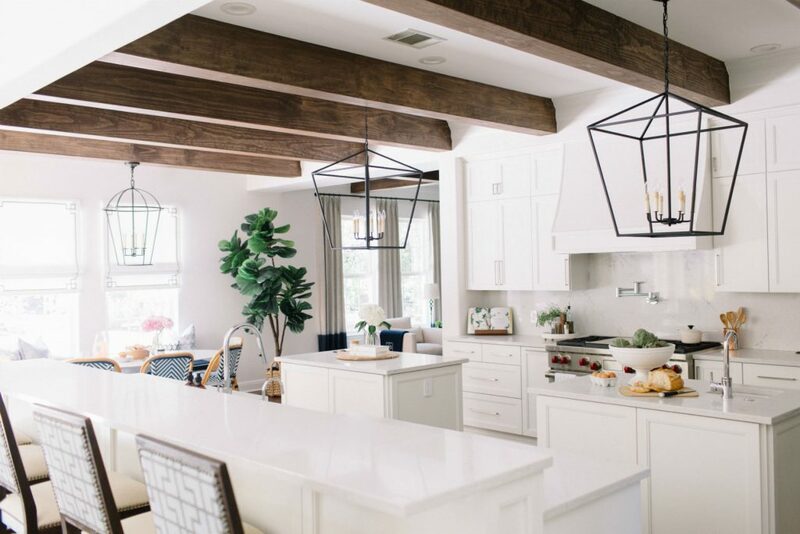 If you are interested in remodeling your kitchen or building a new home your choices are going to be different than someone who is simply swapping light fixtures or making other small cosmetic changes to their kitchen. The goal is for your kitchen to flow seamlessly with all the other spaces in your home. In order to accomplish this, you have to consider what other elements you plan to have throughout your home. For example when it comes to metals, if you want to introduce brass into your kitchen make sure that it is sprinkled around your home; otherwise, it will look accidental rather than intentional. We admit this step is hard, but when you spend a little time on this you can really narrow down the choices and make the rest of the process that much easier. If you struggle with the big picture and the details, hire a professional! 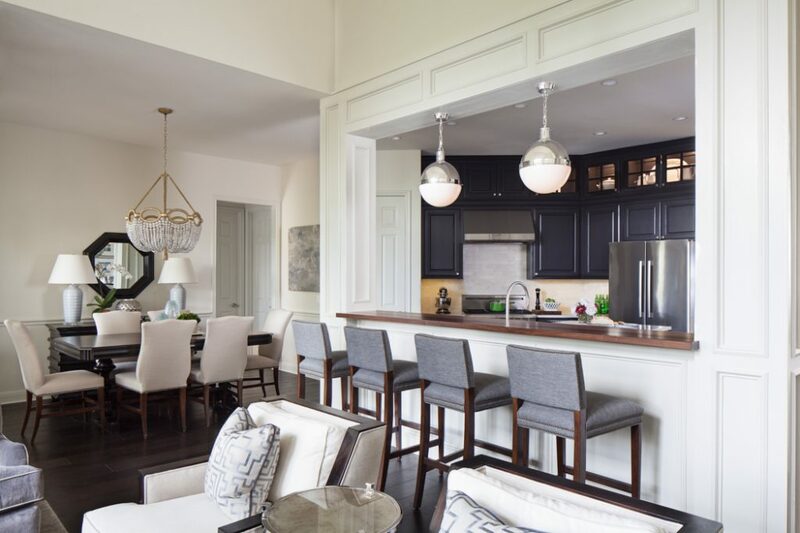 The kitchen from our Southern Living Home features a mix of 3 metals: bronze lanterns, nickel hardware and black range hood. 2. Narrow down your metals. Once you have considered the ‘big picture’, it makes it much easier narrow down which metals are right for you and how you can mix them into your home with ease. Most designers will tell you to stick with 2-3 metals in a kitchen. Just like with color, for visual structure, you will have to pick a dominant metal and 1-2 secondary tones that will serve as an accent. Otherwise, your kitchen might start to feel chaotic. Also, not all metals play well with others, some metals are warm and others can read cold. For example, if you plan to mix in gold/brass into your kitchen, nickel is a better choice. It has a warmer tone and naturally mixes with naturally warm brass/gold metals. The light fixtures in our Bramble Crest Haven project display a mix of metals, polished nickel kitchen pendants and beaded chandelier with gold in the breakfast nook. Now that you have considered your goals and the set of metals that will work in your kitchen and flow with your home, it is time to mix them! Here is an easy list of designer rules-of-thumb you can reference when mixing metals. The polished nickel plumbing is shown above. This is one of your kitchen’s big statements! Lighting can bring out your dominant metal finish or your accent metal. For example, if you have selected polished nickel plumbing, brass or black iron could be brought in with your pendants. In our ‘Villa Blanca’ project we kept with the 3 metals rule. We mixed black iron pendants, chrome plumbing and satin nickel cabinet hardware. 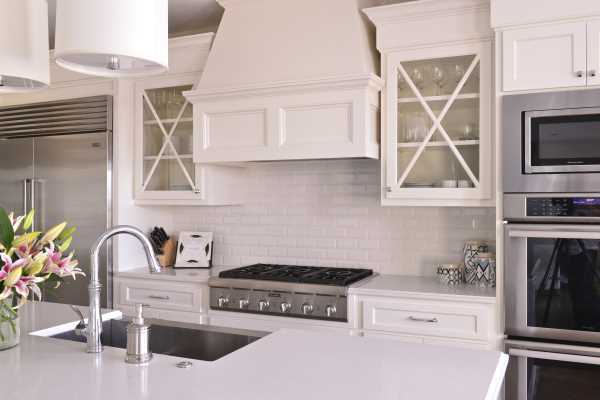 Match your cabinet hardware to your plumbing or light fixtures. This will give your home that intentional and thoughtful mix we discussed earlier in the post. Polished nickel hardware is shown above, which matched the kitchen’s polished nickel plumbing. This project matched the polished chrome plumbing and hardware. The light fixtures mix in polished nickel. 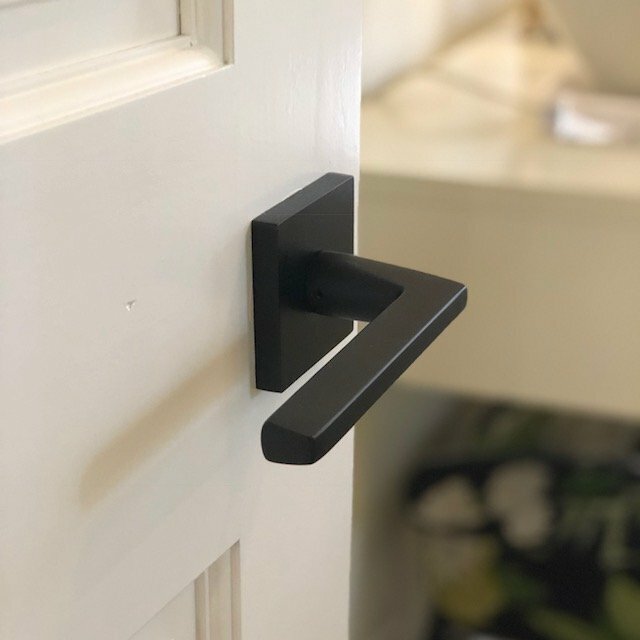 Black is a classy and timeless metal option for door hardware and hinges. It also pairs well with other metals and acts as a neutral. 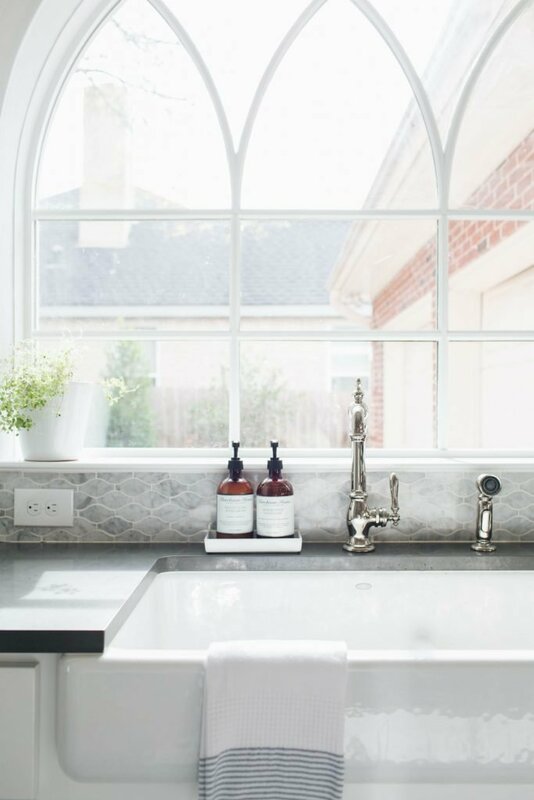 Black works well with many of the different architecture styles popular in Austin, including Tuscan, farmhouse, and cottage style homes. It is becoming increasingly popular, with many more companies now offering a black finish for plumbing and hardware. We hope you found our tips helpful! For more design guidance, our team can help you manage all the details. Get your design quote here. Hi Dee! Thank you. Try Benjamin Moore White Dove it is the perfect warm white. It goes with everything. Oh my goodness. You made that so easy to understand and follow.Thank you for including photos as examples. As I stated on Instragram, I am starting over, and can not afford to make any design mistakes. This home will solely be a reflection of my decor style. Again, Thank you for sharing your design knowledge. Hi Debra! So glad you found the post helpful! Thank you for the idea.